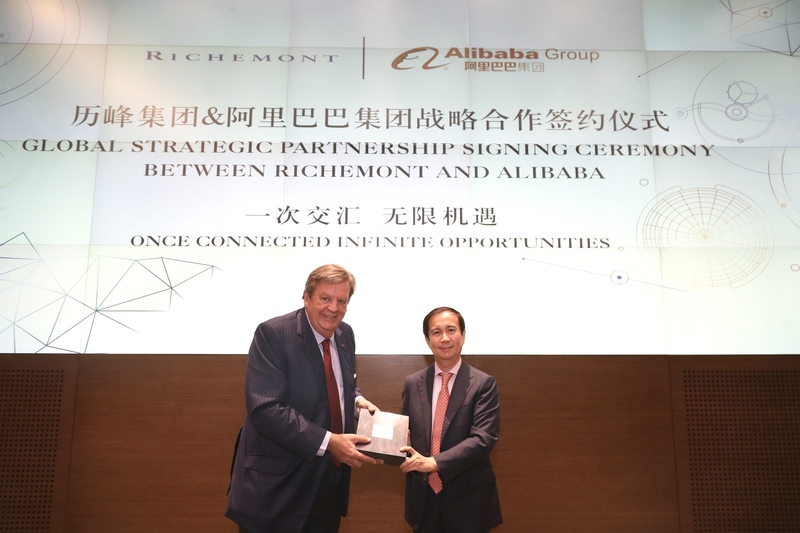 Hangzhou, China, October 26, 2018 - Richemont, the Swiss luxury goods group, and Alibaba Group today announce a global strategic partnership to bring the retail offerings of YOOX NET-A-PORTER GROUP S.p.A. (YNAP), the world’s leading online luxury retailer, to Chinese consumers. Richemont owns a portfolio of leading international ‘Maisons’ which are recognised for their distinctive heritage, craftsmanship and creativity. The Group operates in four business areas: Jewellery Maisons, being Cartier and Van Cleef & Arpels; Specialist Watchmakers, being A. Lange & Söhne, Baume & Mercier, IWC Schaffhausen, Jaeger-LeCoultre, Officine Panerai, Piaget, Roger Dubuis and Vacheron Constantin; Online Distributors, being YOOX NET-A-PORTER GROUP and Watchfinder.co.uk; and Other, including Alfred Dunhill, Azzedine Alaïa, Chloé, Montblanc and Peter Millar. For the financial year ended 31 March 2018, Richemont reported sales of € 10 979 million, operating profit of € 1 844 million and profit for the year of € 1 221 million. Richemont ‘A’ shares are listed on the SIX Swiss Exchange, Richemont’s primary listing, and are included in the Swiss Market Index (‘SMI’) of leading stocks. Richemont South African Depositary Receipts are listed in Johannesburg, Richemont’s secondary listing. YOOX NET-A-PORTER GROUP is the world’s leading online luxury fashion retailer. Its unrivalled offering includes multi-brand in-season online stores NET-A-PORTER and MR PORTER, and multi-brand off-season online stores YOOX and THE OUTNET, as well as numerous ONLINE FLAGSHIP STORES, all “Powered by YNAP”. Building on its Anglo-Italian roots, the Group has established offices and operations in the United States, Europe, Middle East and Asia, and delivers to more than 180 countries around the world.